Former New York Mayor Rudy Giuliani says special counsel Robert Mueller's team is trying to frame President Trump. Giuliani, who has been serving as Mr. Trump's lawyer amid the Russia scandal, says Wednesday in Israel that Mueller's team includes "13 highly partisan Democrats ... (who) are trying very very hard to frame him to get him in trouble when he hasn't done anything wrong." 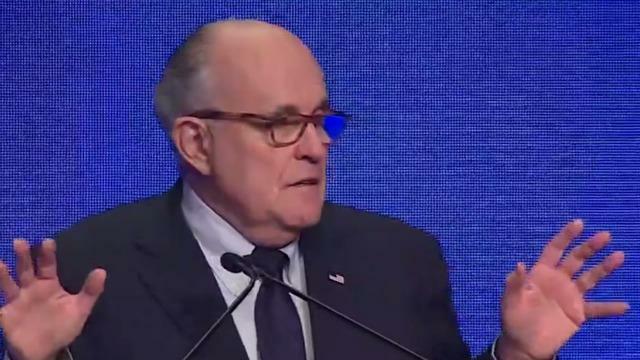 Speaking to the Globes capital market conference in Tel Aviv, Giuliani says Mr. Trump has the power to pardon himself but won't because he is innocent, a claim he's repeated several times before. "Pardoning himself would be unthinkable and probably lead to immediate impeachment," Giuliani told NBC's "Meet the Press" last week. "And he has no need to do it, he's done nothing wrong." Mr. Trump himself has made similar claims, saying on Monday that he has the "absolute right" to pardon himself, but vowed he wouldn't use it. Giuliani has become a lightning rod during his tenure on Mr. Trump's team, drawing the president's ire for a series of scattershot interviews.